Sometimes my mind wanders into weird territory while brainstorming crafty ideas, and I have no clue how it gets there. It's actually more of a transporter of thought than a train of thought, jumping randomly from A to C, instead of following the logical path of A, B, C. I live for these moments. So what do you get when you combine awesome cookie cutters with transported thoughts and random craft supplies? 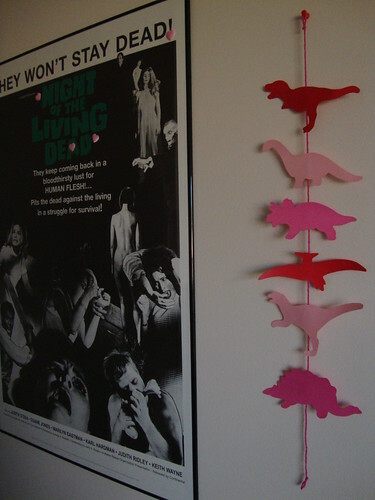 An awesome Valentines Day decoration! 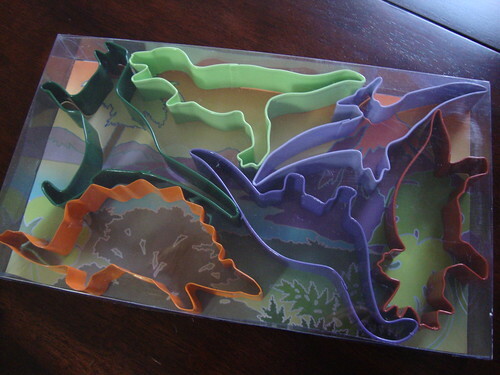 I traced my dinosaur (and pterosaur) cookie cutters onto card stock, cut them out, gave them a coat of Mod Podge for durability, then glued them onto a piece of yarn. I think they look quite lovely next to my decorated-for-Valentine's Day NOTLD poster!